After Monte Carlo, in a close second place in the glitz and glamour awards is no doubt the Singapore Grand Prix. It may not have the illustrious history of Monaco, but the race around Marina Bay has the honour of being known as the only true night race in Formula 1 and is an amazing spectacle. Not just incredible city to visit, Singapore holds one of the most breathtaking grand prix of the season! Singapore is bustling city that is also a fully sovereign state, a characteristic that it shares with Monaco and the Vatican City. This makes Singapore the smallest country in Asia and the second most densely populated nation in the world. Over four million people live on the island that is just 41km across. Singapore is located on the southern tip of the Malaysian mainland and is also very close to the northern Indonesian island of Sumatra. The country switched between British, Malaysian and Indonesian rule until 1965 when it gained full independence. At that point Singapore started industrialising and is now one of the leading financial sectors in Asia. The Metropolitan business district of the city is on the south of the island and the Grand Prix track runs along the downtown streets that line Marina Bay. Singapore first hosted a ‘Grand Prix’ in 1961 although it was then known as the Malaysian Grand Prix and was not run to international rules. This track was abandoned in the seventies but the local Government started work on securing a Formula One race. They went very close to finalising a deal in the eighties and everything was ready to go with a purpose built track near the airport. However, this failed before the circuit was built because the land was deemed unsuitable for construction. At the turn of the century the Government revived the idea but switched its attentions to a street race in an effort to make the event more cost effective. A deal was struck in 2007 after a few years of negotiation and, like many new circuits on the F1 calendar, the Government funded most of it. As well as making money from the sale of Singapore Grand Prix tickets, the race provides a massive tourism boost for the tiny nation. The pits and paddock complex are built on a new patch of land reclaimed from the sea that also houses the Singapore Flyer, the World’s largest Ferris Wheel .The main straight is not particularly long and runs under a freeway bridge before turning away from the water. The track loops back onto itself with a series of tight bends short straights before cars reach the very long back straight that spans almost the full length of the circuit. A series of right angle bends lead cars back down to the water where they race over the historic Anderson Bridge, the circuit’s equivalent to the Monaco tunnel. Another series of short straights and chicanes then take drivers along the water’s edge and back onto the main straight, passing under a grandstand as they go. There are currently rumours suggesting the final sector of the circuit will be made faster in 2010 to improve the racing. There have been two Grands Prix on the streets of Singapore and both had reasons to be considered exciting. Despite being a street circuit there are overtaking opportunities, and the nearby walls have resulted in a number of incidents. The circuit is incredibly bumpy and is a huge physical challenge for the drivers who are likely to make numerous mistakes as a result. This demanding nature of the circuit is magnified by the fact that Singapore is one of the longest races of the year. Ferrari had the fastest car in 2008 but did not figure in the race because of a strategic error, whilst Lewis Hamilton’s McLaren dominated the 2009 event. The pitlane was a deciding factor in both races with a number of main contenders given penalties for speeding, cutting the blend line, or stopping under the safety car. The physical nature of the circuit is the biggest challenge for drivers. There are very few places where they can rest and the track surface is incredibly bumpy. The tropical heat in Singapore is also a factor and the temperature does not improve a lot when the sun goes down. The track forces mistakes from tired and weary. The cars are also punished by the bumps and the level brake wear is very high. In 2009 both Red Bulls and Brawns experienced serious brake problems. Interestingly, adjusting to night racing isn’t much of a challenge for the drivers but it could be if it rains. Not only will the droplets falling from the sky reflect the light, but the track surface will effectively turn into a mirror. This very issue forced the cancellation of a MotoGP night race in Qatar and would cause similar problems for F1. 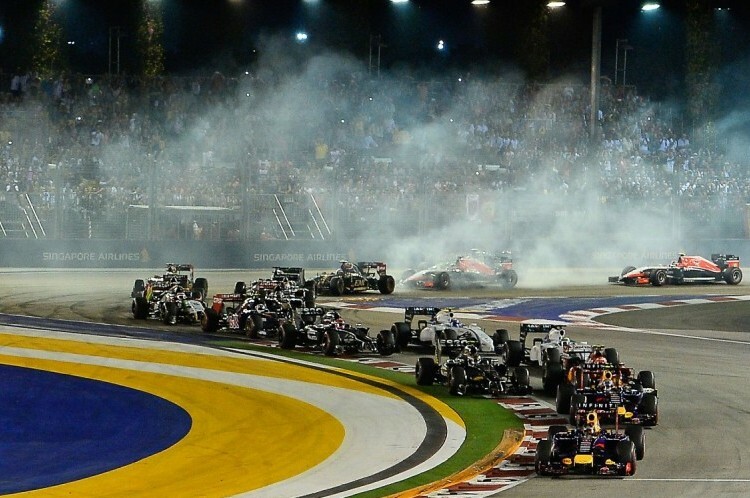 Singapore represents the future of Formula One and is still the only event on the calendar held entirely at night. As well as looking spectacular, the racing can be tight and the close barriers harshly punish the tiniest of mistakes. 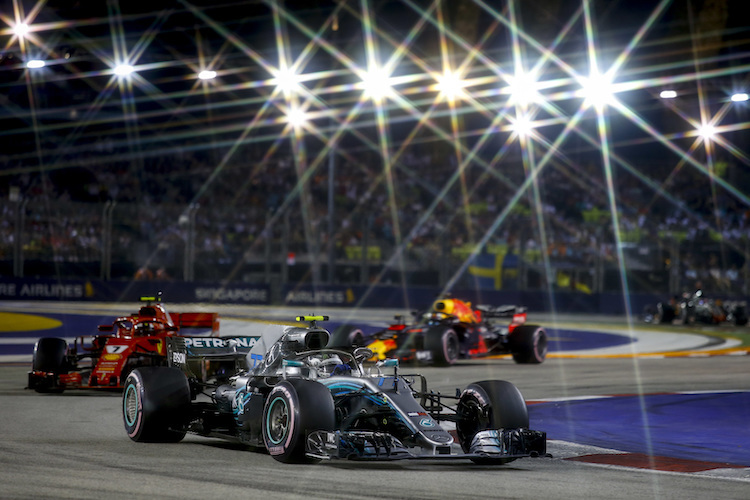 The unique spectacle of F1 at night is worth it alone and is the reason that Singapore Grand Prix tickets are always to high in demand year on year. 2008 : Nelson Piquet Junior sparked one of the most controversial incidents in Formula One history by crashing on purpose to benefit his teammate. Piquet’s accident on lap 13 brought out the Safety Car which played into the hands of Fernando Alonso’s early pitstop strategy. Alonso went on to win the race, whilst Renault bosses were banned from the sport twelve months later when the incident came to light. 2008 : Felipe Massa’s World Championship chances were dealt a killer blow by a pitstop that went horribly wrong. Massa was released by his Ferrari mechanics even though the fuel hose was still attached to his car. Felipe reached the end of the pitlane where he patiently waited for his mechanics to run down and extract the hose before he rejoined the race. Some of the other team garages humorously cheered Ferrari’s mechanics as they ran past. 2009 : Sebastian Vettel was given a drive through penalty for pitlane speeding despite not actually exceeding the speed limit. Vettel had taken a slight shortcut into the pitlane and, as a result, his average speed over the measured distance was judged to have been too fast. The penalty dropped Vettel out of winning contention and he finished the race in 4th. 2009 : Adrian Sutil spun after making contact with Jamie Alguersuari, but crashed into Nick Heidfeld whilst rejoining the circuit. Heidfeld was out on the spot, prompting him to tell the press “I think we need to find Sutil a new brain”.